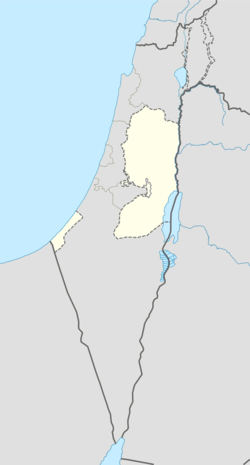 Aida (Arabic: مخيم عايده‎), also spelled 'Ayda, is a Palestinian refugee camp situated 2 kilometers north of the historic centre of Bethlehem and 1 kilometer north of Beit Jala, in the central West Bank. Children returning home to Aida Camp from school, with the Israeli separation barrier in the background. According to the UNRWA, the camp had a population of approximately 5,498 refugees at the end of 2014. Named after a famous coffeehouse (maqhah) located on the site in the early 1940s, Aida camp was established in 1950 by refugees from the Jerusalem and Hebron areas, and covered an area of 66 dunams (0.17 square kilometres). At the time, Aida housed 1125 refugees living in 94 tents. The camp came under special hardship during the Second Intifada, when the school sustained severe damage and 29 housing units were destroyed by Israeli military incursions. The Israeli military placed the camp and surrounding areas under curfew, made arrests and even demolished walls between houses in order to bypass the roads in the camp. In one such maneuver, camp resident Huda Hawaja was mortally wounded when Israeli soldiers demolished her doors, and died after there were delays in calling an ambulance due to the military presence. The incident was documented by embedded journalists and broadcast on Channel 2, leading to a public outcry and backlash from the Israeli military against the press. Pope Benedict XVI visited the refugee camp during his Middle East pilgrimage visit to Jordan, Israel and the Palestinian territories in May 2009. He said that the refugees lived in "precarious and difficult conditions" and that "It is tragic to see walls still being erected". On 29 October 2015, at dusk, a video filmed on his iPhone by a resident of the Aida Refugee Camp, Yazan Ikhlayel (17), captured a megaphone address made from an Israeli military vehicle during a raid into the camp. The speech warned residents that, if they did not desist from stone throwing they would be gassed to death -children, youths and the aged. Referring apparently to the arrest of Qassan Abu Aker, the speaker added that one of the arrested would be killed as the residents looked on if the throwing did not stop. The Border Police immediately suspended the officer suspected in the incident, and is reviewing his continued service in the force. 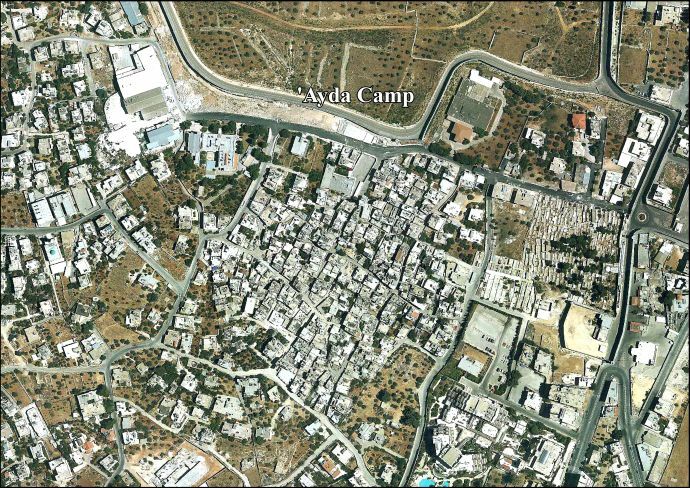 Aida camp is adjacent to Rachel's Tomb, walled off from Jerusalem by the Israeli West Bank barrier and contiguous to the Israeli settlement of Gilo. The Aida Refugee camp is adjacent to a new 4-star hotel, the Intercontinental, on the Jerusalem-Hebron road. On the camp's entrance gate a huge "key of return" is pictured, and on the separation barrier a largo graffito has been painted with the words Gernika [Guernica]1936 – Palestina 1948. The camp contains two schools and no health clinics, although UNRWA has provided assistance for physicians and physiotherapists to provide medical assistance within the camp. Access to water is often disrupted for Aida's residents, and sewerage is poor. The unemployment rate in Aida stands at 43%. Aida is the location of the Al Rowwad Cultural and Theatre Training Center and the Lajee Youth Center, both of which practice cultural and creative forms of resistance. Refugees in Aida camp have practiced predominantly non-violent opposition to the Israeli occupation. The situation for youth in Aida camp was publicised in Flying Home, an illustrated children's book produced by Lajee in 2009. Wikimedia Commons has media related to Aida (camp). ^ Survey of Palestinian Refugees and Internally Displaced Persons 2013-2015 Volume VIII. Badil. p. 40. ISSN 1728-1679. ^ "A Day in Aida Refugee Camp". UNRWA. Retrieved 12 March 2016. ^ a b c "Where We Work - Camp Profiles". UNRWA. Retrieved 12 March 2016. ^ a b "History - Aida Youth Centre". Aida Youth Centre. Retrieved 12 March 2016. ^ Palmer, Tim (22 March 2002). "Security heads to meet amid ongoing Mid East violence". Lateline. ABC. Retrieved 14 March 2016. ^ Lavie, Aviv (18 March 2002). "Trying to Buck the News Blackout". Haaretz. Retrieved 14 March 2016. ^ McCarthy, Rory (14 May 2009). "In Bethlehem, Pope Benedict XVI makes strongest call yet for a Palestinian homeland". The Guardian. Retrieved 12 March 2016. ^ Megan Hanna,'Israeli soldiers tell Palestinians: ‘We will gas you until you die',' Ma'an News Agency 29 October 2015. ^ Sheren Khalel and Abed al Qaisi, 'WATCH: Israeli forces threaten Palestinian refugees over loudspeaker,' Middle East Eye 30 October 2015. ^ a b . 'Border cop suspended for threatening to ‘gas’ Palestinians,' The Times of Israel, 30 October 2015. ^ Megan O'Toole,‘Israeli officer: 'We will gas you until you die',’, Al Jazeera,31 October 2015. ^ a b c Gideon Levy and Alex Levac, 'The most surreal place in the occupied territories,' Haaretz 30 March 2014. ^ "Ayda Camp (fact sheet)" (PDF). ARIJ. Retrieved 12 March 2016. ^ "Refugee Assistance". Al-Majdal. Badil. Retrieved 12 March 2016. ^ Elmuti, Dina (28 September 2009). "Courage and resistance at Aida refugee camp". Electronic Intifada. Retrieved 12 March 2016. ^ "Who We Are". Al Rowwad. Retrieved 12 March 2016. ^ "About Us". Lajee Center. Retrieved 12 March 2016. ^ Wiles, Rich. "The Art of Resistance". Al-Majdal. Badil. Retrieved 12 March 2016. ^ Haddad, Toufic. "Book Review: Flying Home". Al-Majdal. Badil. Retrieved 12 March 2016.